Yes, Nokia is leaping from the burning platform that is Symbian. Yes, they’re leaping from MeeGo, as well. And yes, their initial safe harbor appears to be a Windows Phone device codenamed “Sea Ray.” But that doesn’t mean that Symbian is dead just yet. 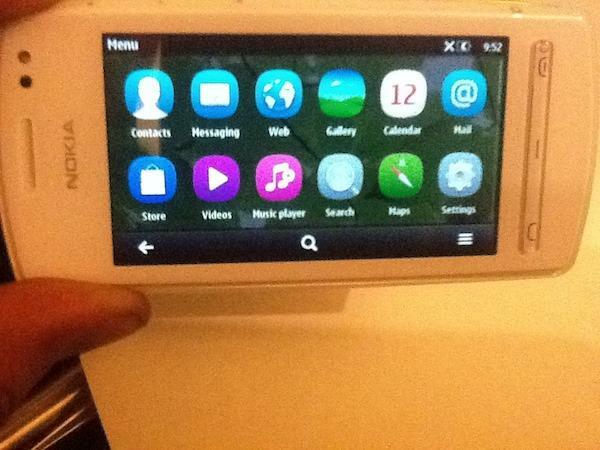 N5 was caught in pictures and is definitely running Symbian Anna, the same latest and greatest variant of the OS found on the newly minted X7 and E6 devices. Excellular, who leaked the photos, had no specs or other specific information about the device. 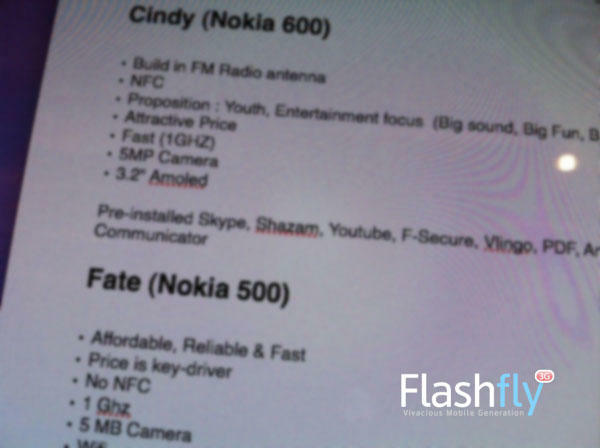 A few days earlier, however, Flashfly posted what they claim to be internal Nokia documents outlining the basic features of four new devices: Fate (500), Cindy (600), Zeta (700), and Helen (701). The device shown in those photos appears to match up with the description of Cindy/600, including a 3.2″ AMOLED display and 5.0 megapixel camera. If that bears out, Cindy would also sport a 1GHz processor, NFC technology, and a host of other features and pre-installed software aimed at “Big Fun.” Woo! The Nokia Blog’s Mark Guim said his sources have already told him about Nokia ditching their C, E, N, and X Series naming scheme in favor of simple numbers, so the dots may just be connecting here. range and is definitely running Anna, even though she looks a fair amount like MeeGo. The phone is shown in black, green and white, has a camera with flash and a “5.0 Megapixel” label, and is designated as “Nokia 0-00,” their standard model number for internal prototypes. Symbian may be on its way out, but tens of millions of people still rely on the platform for their daily mobile communications needs. So the phase-out will take time; Nokia’s already said as much. Introducing some new Symbian devices in line with Nokia’s forthcoming design and naming conventions makes business sense given the company’s global presence: Offer the longtime faithful some updated hardware with the latest OS build as transitional devices to warm them up to Nokia’s future without forcing them to jump to Windows Phone before their ready (and, perhaps, before WP is fully matured). Nokia’s first crop of Windows Phone Mango phones are going to grab the spotlight, for sure, but a handful of refreshed phones running Symbian Anna could do at least a little to keep longtime friends of the Finnish company loyal to the brand while they get used to the idea of a future without the operating system they’ve grown so accustomed to over the years.